Last week in Amsterdam, I had the privilege to attend the Fab6 conference. 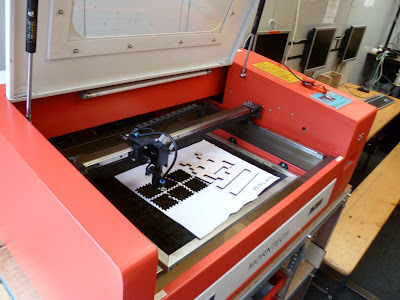 For those not in the know, the FabLab network (the raison d'etre for my entire summer of study and travel) is a network of digital fabrication labs which started as a project of MIT's Center for Bits and Atoms. It now comprises nearly 50 labs all over the world, including FabLab Norway in Lyngen, where I started my adventure this summer. The FabLab project has, over the last several years, transitioned from an outreach project of MIT to a (mostly) self-organized consortium of labs, who use a similar toolset to address diverse problems. One of the big pieces of news released during opening day was that US Congressman Bill Foster of Illlinois (self-described as "1/3 of the Congressional Strategic Reserve of Scientists) has introduced HR 6003, the National Fab Lab Network Bill, to establish the framework for a network of labs in the US. He likens the establishment of the network to the Carnegie Library system, which brought knowledge to the public in printed form. Recognizing our contemporary conception of information as imbedded in physical organization and coded onto silicon chips, the FabLab network will give communities throughout the US access to the tools of innovation and knowledge creation. So that's pretty exciting. 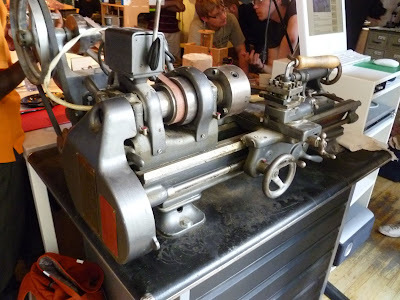 The Fab6 conference is organized by the Netherlands FabLab network, and is based in the Waag building in Nieumarkt square in Amsterdam (although sessions will be held in other labs throughout NL). The Waag is an amazing building, built in 1448 as one of the main gates in the city walls. 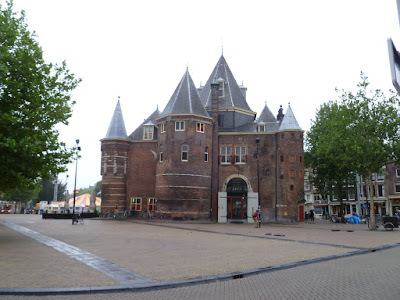 It has since served many other purposes, but is primarily known as the former Guild house and also the weigh house for the markets at Nieumarkt. The main sessions at Fab6 are being held in the anatomical theater, the site of this painting by Rembrandt. 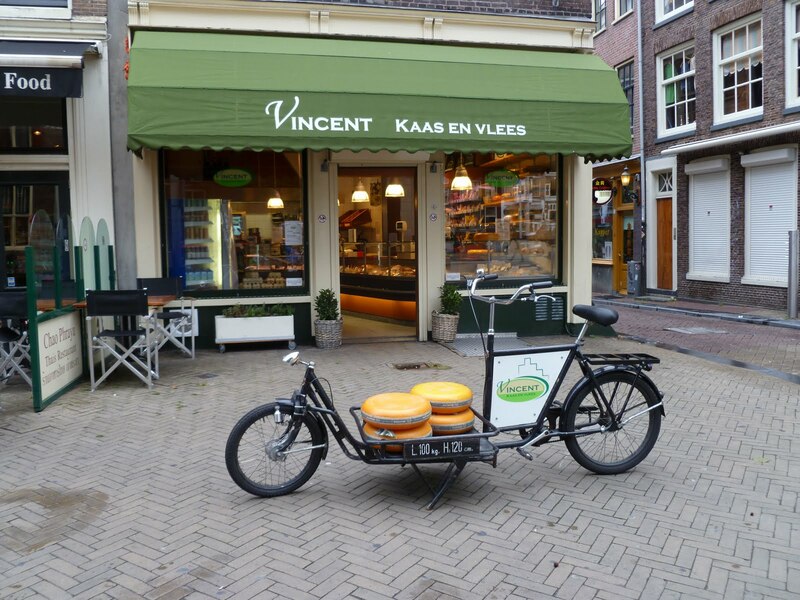 Across the street is a cheese shop, complete with awesome delivery bike. Laser cutters and computers are not particularly beautiful, but this nice little lathe in the Amsterdam lab certainly is. They 2 guys in the background are discussing the Mantis, which is a small mill being developed at MIT to replace the (relatively) expensive Roland Modelas currently used by the FabLabs. One of the main topics of conversation, and a primary route for MIT to continue to support the project, is the development of a low cost suite of tools and software which could be build and customized by existing labs, reducing the startup cost for new labs. On Tuesday, I attended sessions in Amersfoort, at a new lab started by members ofSpullenmannen, a group of visual and theater artists who make art using industrial/technological detritus. They used this KUKA robot (which they got for free from a defunct car factory) to make this totally cool video (it's the one on the lower left), and are working on a dance piece with the KUKA as protagonist. 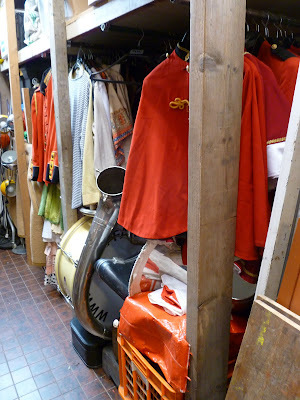 Their lab is in an old food coloring factory, and is overflowing with treasures waiting to be reused, including a costume department (I feel that every FabLab should include a costume department, but that could by my BFA talking). 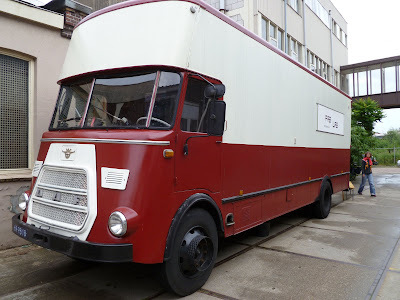 The Spullenmannen (Dutch for StuffMen) were also hosting the mobile FabLab truck, which was very adorable. It's been traveling all over DE and NL this summer, encouraging people to make their own tshirts at music feltivals and the like. The van is outfitted with a Chinese laser (referred to constantly as THECHINALASER), which was purchased for only 3K euros (that's cheap!). The focus of the day's sessions was founding a lab for free or for cheap, including the challenges that come with owning a CHINALASER. I'm fairly certain that every single part except the enclosure and the laser itself can be ordered from McMaster-Carr, which actually kind of recommends it (unless you can get excellent service from your name brand laser dealer and don't have to worry about repairs). 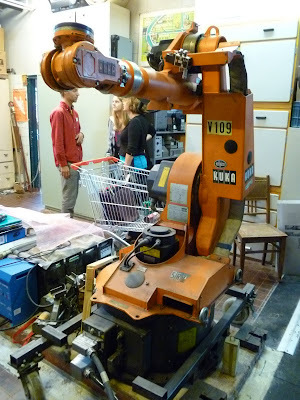 The other sessions covered reusing plastic and other materials for use in the laser cutter, and concluded with the drafting of a Recycling Manifesto for the FabLab organization, as well as the creation of a work group to organize an online resource for plastics identification and health information. 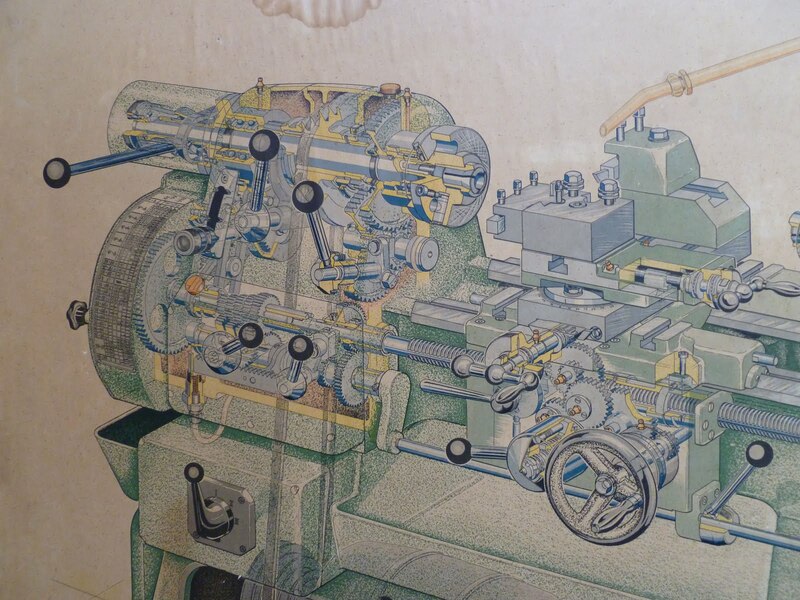 One of my favorite pieces of Spullen was this totally dope poster of a cutaway view of a Dutch lathe. I think this might be replacing the cutaway Sturmey-Archer as my desktop image. More on the second half of the conference later.